Last summer in Wisco we had a serious drought and this spring it seems it just won’t stop raining. For quite a while it’s been either rainy or grey, bringing us a wallop of cold air every so often just to keep us guessing as to what season it’s actually supposed to be. 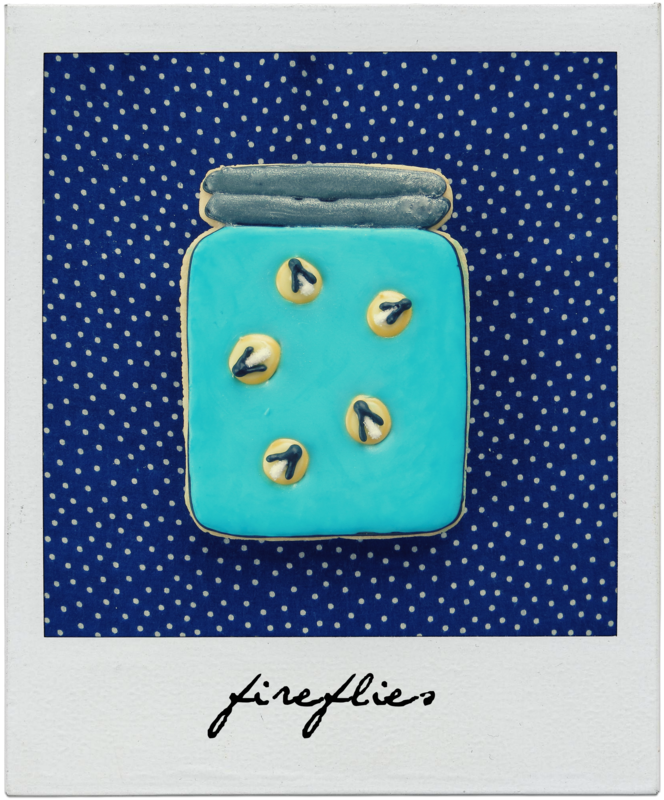 Therefore, I was on a mission to make summer related cookies and fireflies were one of the first things to come to mind. I had also been wanting to host a little birthday giveaway on my facebook page, so it seemed to be the perfect reason to try them out and gift ’em. Me turning 41, fireflies in a jar, and summer (hopefully) on the way? Let’s do it! 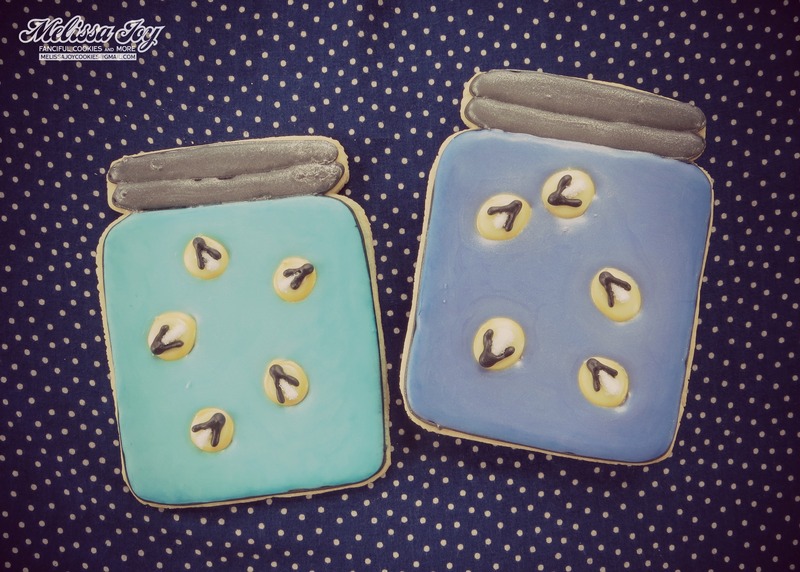 I made my cookies like so, hand cut with a template I drew out first. Cookies with Character made some of my favorite cookies ever by making these Ball Jars. So fabulous. 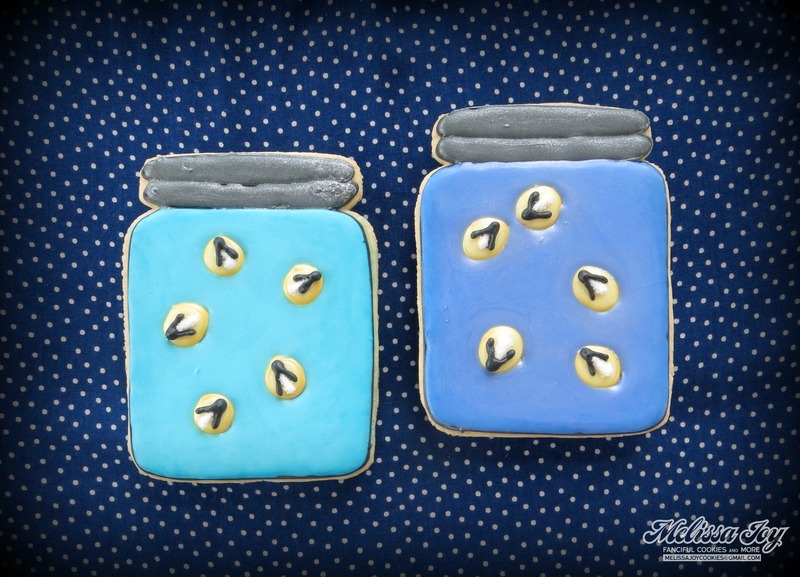 That whole idea took off and now I can’t stop thinking about what I can make out of a jar cookie…for the cookie jar! Hee hee. In the process of making my own jar cookies, I tried out a shading method using a food writer and paintbrush. I think it is an easy alternative to airbrushing to give the 2D a little depth. And, well, I don’t have an airbrush machine so sometimes you’ve gotta get inventive. 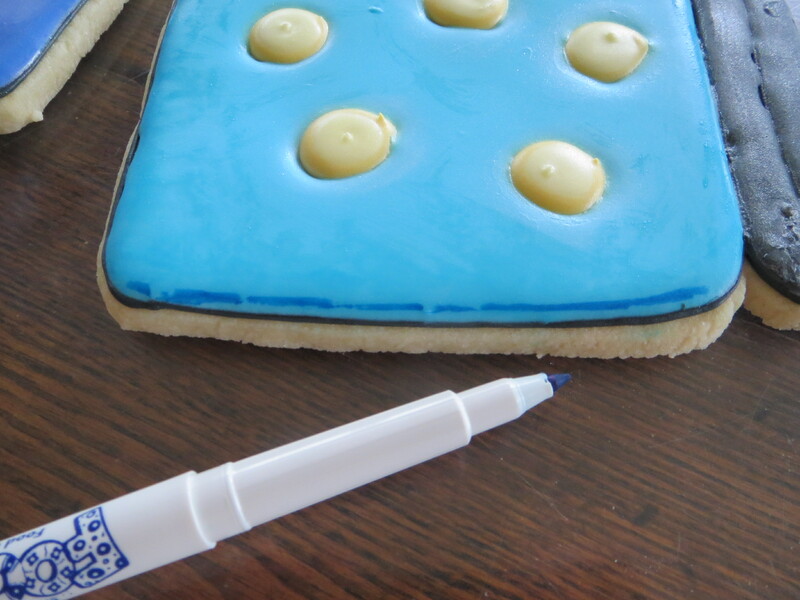 Once the frosted cookie had dried over night, I gently drew a line around the edges of the jar using a Foodoodler marker. I love these things. Next I got out this huge bottle of vodka, even though I am strictly a wine drinker. It’s five o’clock somewhere, right? 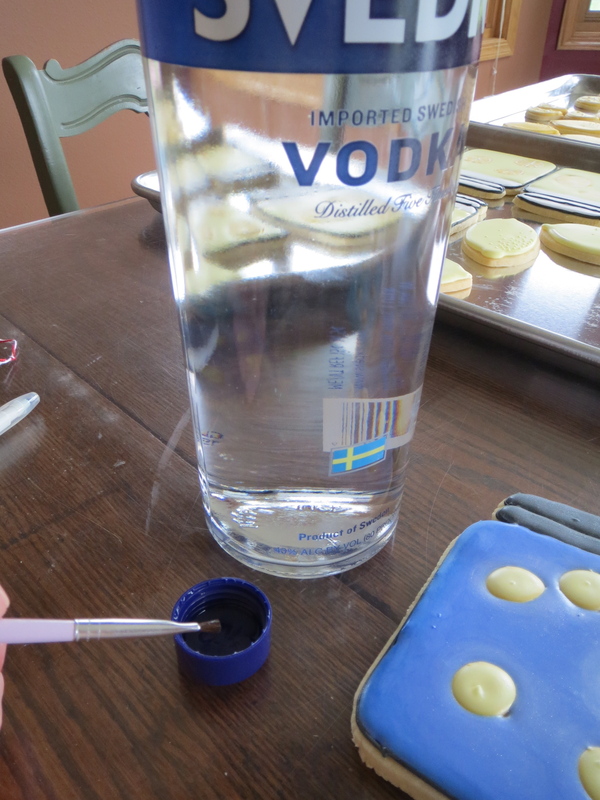 I poured a little vodka in the cap so I could wet my paint brush and go over the lines I drew on the cookie. Sort of like one of those books my mom bought me as a kid where you just added water to the colored pages and could paint. Those were the coolest. Do they still make those? 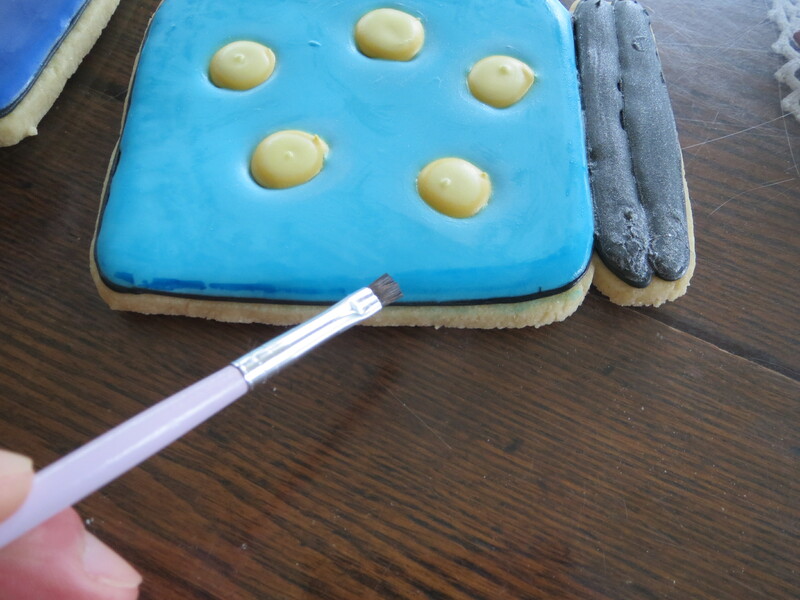 I first tried using water to blend the marker, but found the water left streaks on the frosting that never went away. Using alcohol seemed to evaporate the way I wanted it to and I still got the same effect. I also used pearl dust, both dry and mixed with the vodka. The dry for some shimmer on the firefly glow and the wet for the top of the jar. Photos can never capture the sparkle, but it’s there! The fireflies themselves were transfers I made. 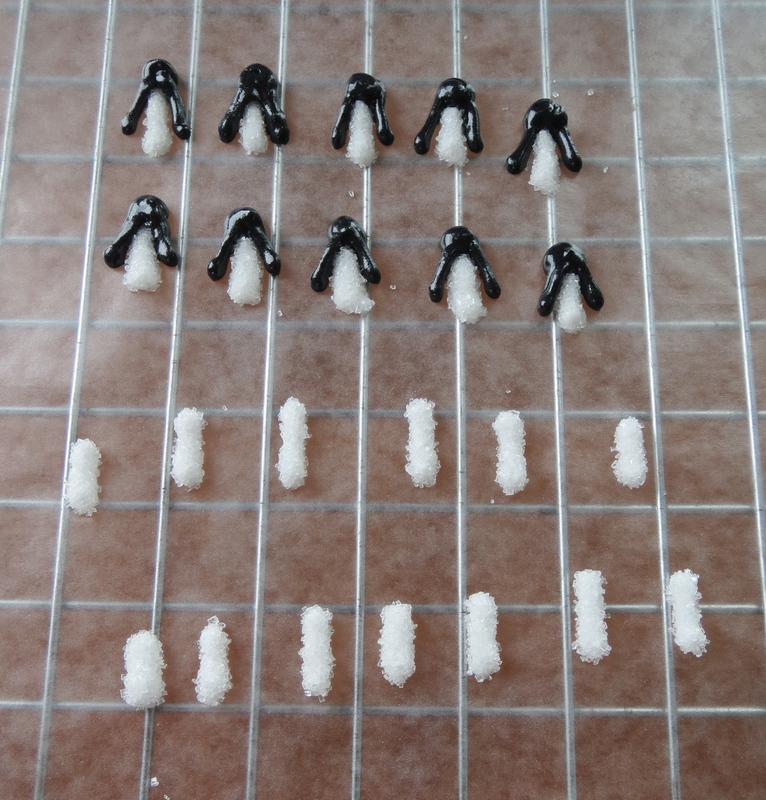 I sanded the white parts and dried them completely before adding the black head and wings. 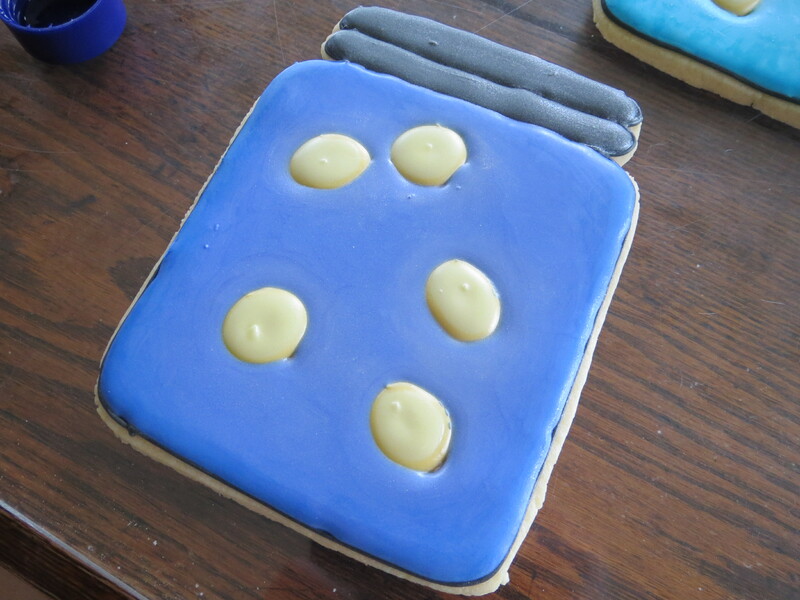 Again, once that was all dry, I adhered them with a touch of frosting to the cookie. Who doesn’t love the magic of a firefly? Our little tribe went on vacation last year and happened to witness a couple nights where they emerged and twinkled. The boys still talk about it and hope our new location, with open fields right out back, provide us with the enchanting experience once again. Alas, the forecast is calling for more rain. Who’s ready for summer? This girl! 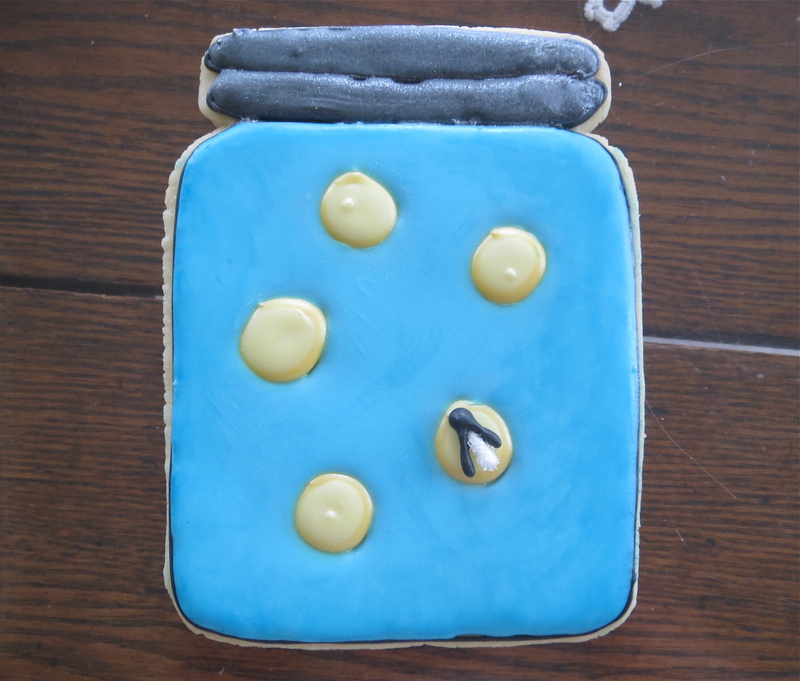 This entry was posted in Birthday Cookies, Cookie Tutorials, For Fun Cookies, Fourth of July Cookies, Spring Cookies, Summer Cookies and tagged fireflies, fireflies in a jar, firefly cookies, jar cookies, outdoors, summer nights, vacation. Bookmark the permalink. I especially like the vodka trick. And those little teenie fireflies . . someone’s got patience. And she didn’t get that from her Dad. 🙂 Once again amazing MJ! Thanks Mom! I should make you some martini cookies with olives. 🙂 ps. I found 2 unopened jars of olives in my pantry after you left on your last visit. If it doesn’t warm up soon, I can always pull off the Disneyland trick and put “firefly” lights in the bushes…that kind lasts ALL summer!